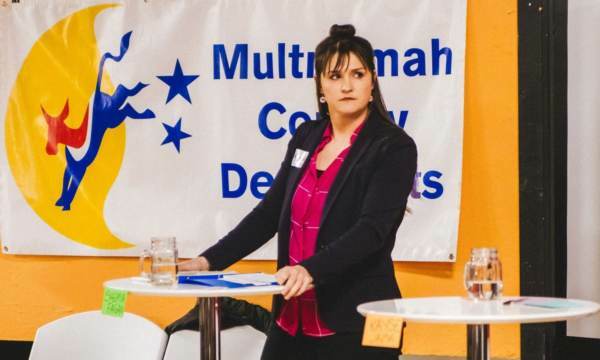 In the never ending race to the bottom, Oregon state senator Shemia Fagan is introducing legislation that would lower the voting age in the state to 16. Citing abortion and stripping away 2nd Amendment rights, Fagan introduced the legislation on Monday, at the behest of doorbelling-for-democrats operation known as the Bus Project. The state senator pointed to the young activists who became engaged after the Parkland shooting in Florida, which left 17 people dead. They proved young people are active and should have a right to vote, Fagan said. Several teenagers spoke in favor of the measure alongside Fagan on Monday at the Capitol. “We’re experts of our own experiences,” said Connor Gabor. People are being sexually assaulted in their schools, Gabor said. People are being shot. Yet, they can’t vote for school board members or lawmakers, he said. Senate Republican Leader Herman Baertschiger, Jr., R-Grants Pass, said 16-years-old is too young to vote. “… (They) are too young to enlist in the military, too young to own firearms, too young to own property, too young to enter into legal contracts, and too young to get married. But they are old enough to vote? People are not legally considered adults in this country until they are 18 years old, and I believe they shouldn’t be able to vote until then either. This is nothing more than an attempt to expand the voter rolls to sway elections,” he said. Not only are the democrats targeting more naive voters, but this is partially in response to the pushback against a massive gun grab bill, that was supposedly written by high schoolers. SB501 would turn gun owners in criminals if someone steals their gun, limit the amount of ammo one can buy to just 20 rounds a month, require background checks for purchasing ammo, and require jail time for anyone who who doesn’t turn in magazines that hold more than 5 rounds. Since many have criticized the gun bill as being written by 16 year olds to tell adults what they and can’t do, democrats are now trying to adult-ize the kids.